The New York Times bestselling author of The Liberator and Avenue of Spies returns with an utterly immersive, adrenaline-driven account of D-Day combat. 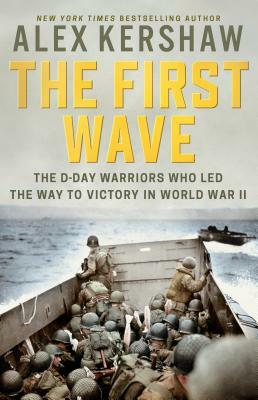 Beginning in the predawn darkness of June 6, 1944, The First Wave follows the remarkable men who carried out D-Day’s most perilous missions. The charismatic, unforgettable cast includes the first American paratrooper to touch down on Normandy soil; the glider pilot who braved antiaircraft fire to crash-land mere yards from the vital Pegasus Bridge; the brothers who led their troops onto Juno Beach under withering fire; as well as a French commando, returning to his native land, who fought to destroy German strongholds on Sword Beach and beyond. Readers will experience the sheer grit of the Rangers who scaled Pointe du Hoc and the astonishing courage of the airborne soldiers who captured the Merville Gun Battery in the face of devastating enemy counterattacks. The first to fight when the stakes were highest and the odds longest, these men would determine the fate of the invasion of Hitler’s Fortress Europe—and the very history of the twentieth century. The result is an epic of close combat and extraordinary heroism. It is the capstone Alex Kershaw’s remarkable career, built on his close friendships with D-Day survivors and his intimate understanding of the Normandy battlefield. For the seventy-fifth anniversary, here is a fresh take on World War II's longest day. Alex Kershaw is a journalist and a New York Times bestselling author of books on World War II. Born in York, England, he is a graduate of Oxford University and lives in Savannah, Georgia. His critically-acclaimed books include The Bedford Boys, The Longest Winter, and Escape from the Deep. He also the author of The Liberator, which is being made into a drama series for Netflix, available in 2020.